This past weekend we did round 1 of spring cleaning. We amassed 7 garbage bags worth of “I didn’t even know I still had this” kind of stuff. It was a lot of work, and hard, and the music had to be turned up extra loud, but we did it. What is your cleaning life like? Do you, you and your mate, or mates share house cleaning duties? Do you have additional outside help? A chore chart? We’re sort of ad hoc when it comes to cleaning at our house. I’d like to say we do a thorough cleaning every Sunday, but that’s just not true. Sometimes it is more appealing to not go hands and knees with a spray bottle of bleach. That said, sometimes the urge to clean strikes at the oddest time, like 8:30 on Saturday morning. Mark is still nursing a cup of coffee and I am reorganizing cabinets. That might be my version of crazy. I think in an ideal scenario I’d be a homemade cleaning products type of gal, with a daily routine to help not only maintain but also extend the life and cleanliness of my house. But that’s the ideal. 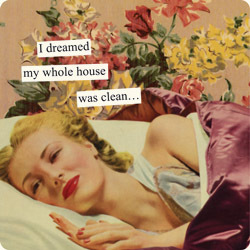 How often and how diligently do you clean your humble abode? This entry was posted in Her Home and tagged chores, cleaning house, spring cleaning. Bookmark the permalink. Our cleaning ritual is on Saturdays… Growing up, no roller skating until your Saturday chores were done… Over the years I’ve added my own twist………With music blaring. I change rooms when a new song comes on…yup drop what I am in the middle of and move on to a new room… Every time you get back to a room you look around and find it’s almost done and is certainly cleaner than when you started! Motivates me every time! Listening to good music always puts a skip in your step and actually, dare I say… makes it fun to do your chores! I love this idea, Sindi! This sounds like it makes a big job less overwhelming and (dare I say?) fun!